Last night it rained in and off a few times, which was enough to keep the Forehatch closed most of the time. The winds in the upper teens to mid 20’s continue. Phil’s project this morning was to check the water level in the batteries. This time he check the batteries on the starboard side which is more difficult to get to having to unfold the boards which make this bunk into a double. The water was a little low and he found that the fresh water pump he bought from Dan Christian was soaked with salt water. This was taken out of them at and laid on the cockpit cushion to dry in the hopes that it would still work. I was wasting time looking at used sailboats on Yacht World. I don’t know why since this is our last trip, but it was something to pass the time. It’s getting a little hard as there isn’t anyone to talk about Katie to. This I know is what colleagues at work were worried about before I left. 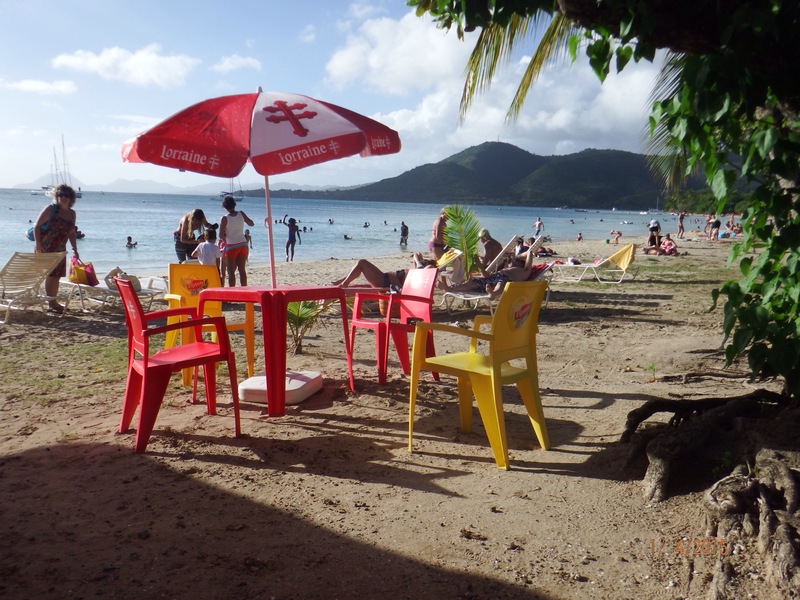 I really need to work on the blog as we haven’t posted since we arrived in Martinique. The first few days we are really busy seeing the sites and then we get lazy. So when Phil suggested we go into town at 1:48PM and walk the close beach I said Yes. The waves are choppy in the anchorage, but I’m tired of being on the boat. We walked the path close to the waterline and saw a few interesting plants with their seeds and flower on the cliff. I did take some photos but decided not to put them in here. soon we got to the main beach on the way to Club Med where there were dive shops, tourist shops, plastic tables with umbrellas for the restaurants. Being a Sunday, there were plenty of families and people of all ages swimming or sunbathing. We found a table and umbrella in the shade and had a seat while Phil went to get a beer and diet coke. After awhile, I started feeling better. 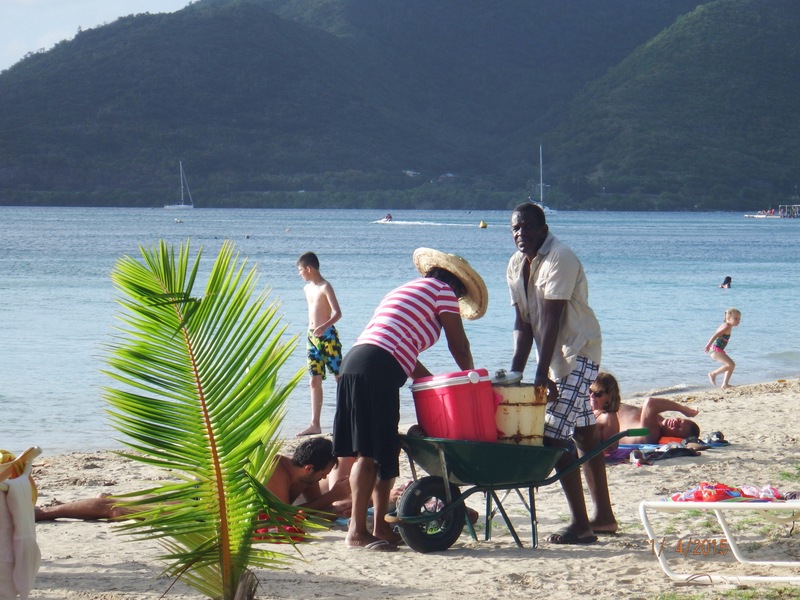 It was nice to watch people and hear the familiar ringing of the bell from the could selling ice cream as they pushed their cart up and down the beach. 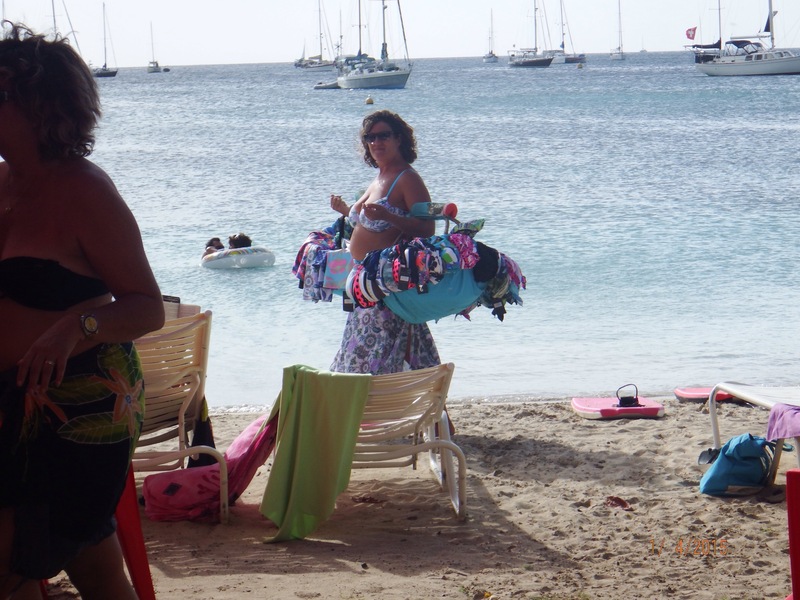 It’s common here too for someone to walk and down the beach with swimsuits for sale hanging on her arms. I started typing blog posts on Pages to transfer later when I had wifi while Phil looked around at the women. Many of the men and women here are fit and the ones that are overweight are not morbidly obese that you see in the USA. We nursed another beer and diet Coke until Phil noticed that the wind had died and that there were dark gray clouds. We packed hurriedly and walked back to the dinghy. 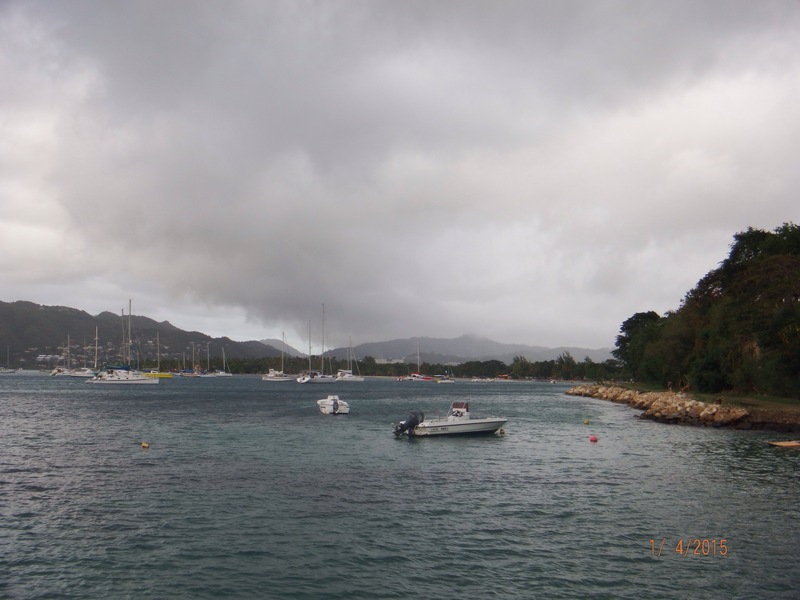 Here are the clouds as we reached the dinghy dock. I know they don’t look like much but they started moving towards us fast. We got in the dinghy with Phil having the outboard in reverses when we stopped. Our painter was wrapped around another dinghy painter. I got up to quickly fix it and fell after losing my balance. Trying to work quickly knowing that the storm is barreling down I got them untwisted and we were off. About 2/3 D’s of the way to the boat the beginning of the rain started. I got out the shower curtain to shield us from the rain. Phil wasn’t able to steer and hold the shower curtain over him from the wind whipping it so he got wet. Quickly quickly we put the bag and us on deck and work to stream the dinghy behind Changes and get under the protection in the cockpit. We were lucky that the starboard side window wasn’t zipped up at the time. Then the strong part of the squall hit with 26kt winds+! but we are safe. It continued raining for 30 min, stopped and another squall it and this repeated another time until was over at 6pm. 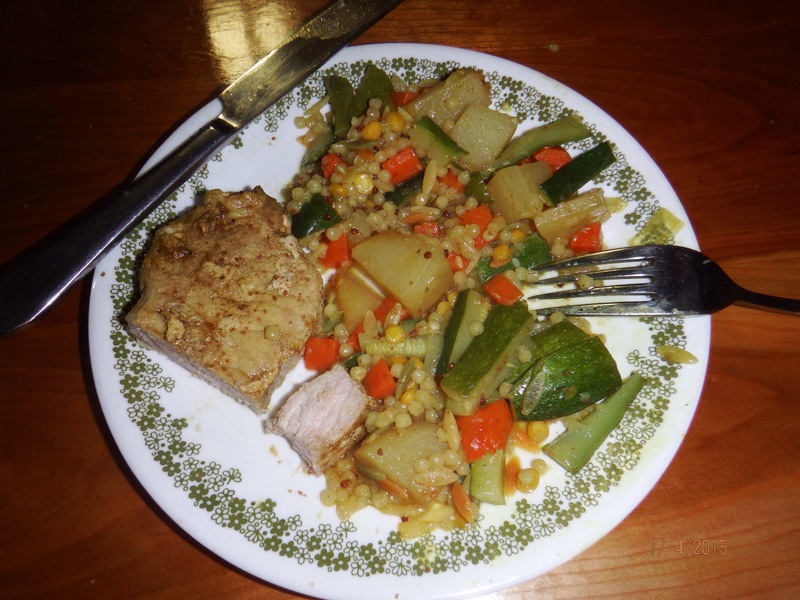 I went below and starting fixing pork chops, vegetables (onions, diced carrots, garlic, the rest of the Chayote and zucchini) with Pearl couscous in one pot for supper. I added a new spice from the Market to this dish which made it taste good! We have enough of the veggie couscous mixture for another meal. It continued raining in and off at 635p, 710p, 720p, 815p, 935p and last time at 1025p before we went to bed. This meant that the forehatch was closed most of the evening as we didn’t know when it would rain again. I posted on the blog while Phil read. Then chatted with my Mom, Rachel and Janet on Messenger. We have wifi here, but every 10 minutes (I timed it) we have to renew the connection going into Safari, clicking on a web page, wait for the Internet login to come up and click on accept terms. Not hard, but a pain BUT at least we have Internet. I keep the Never Not Knitting blog up as it goes the most quickly to the login page. I continue knitting Rachel’s sweater and am now to the part that I start decreasing for the waist. I know I haven’t been gone long, but am missing working. Phil, had to run the engine to charge up the batteries a little. 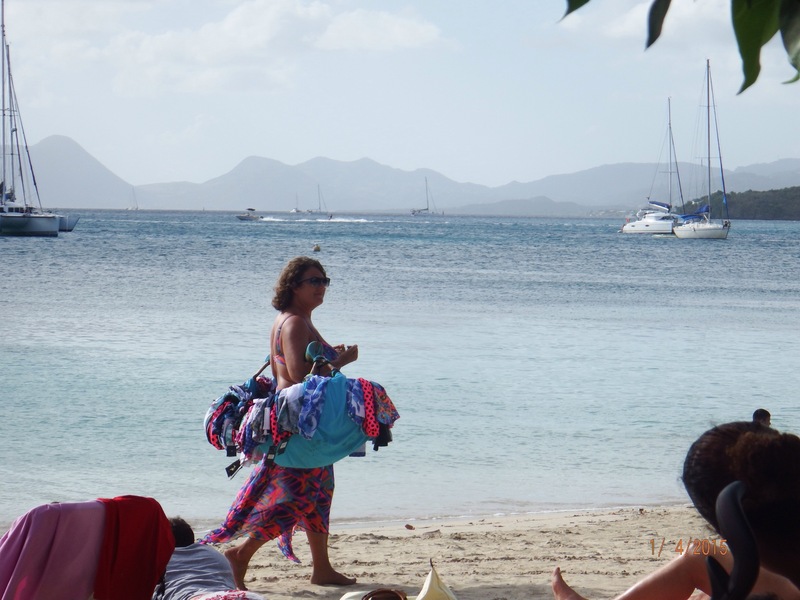 This entry was posted in 2015, Beaches, Caribbean, Family, Knitting, Lorraine's Projects, St. Anne and tagged ice cream, Lorraine Beer, squalls. Bookmark the permalink.